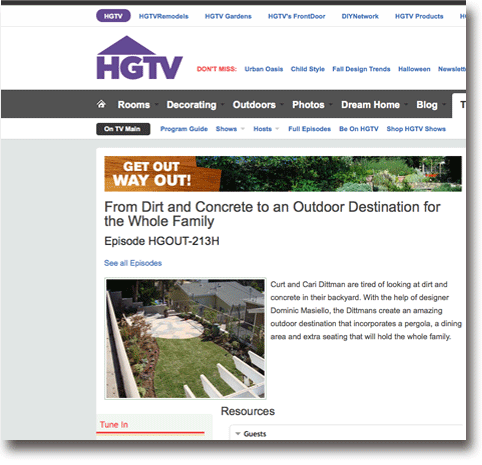 Dominic Masiello of dp environments has been seen on several HGTV programs, including ‘Landscaper;s Challenge’ and ‘Get Out, Way Out’. This Redondo Beach project featured on ‘Get Out Way Out’ was a peculiar design challenge in that this relatively small space not only had to accomidate the family’s needs for entertaining, gardening, and play, but also provide a viewing area overlooking the Pacific Ocean, yet not feel too cramped from the 15 foot retaining wall directly behind the garden. The family also had some stone left over from a previous project which had to be incorporated. The stringent design criteria gave way to creative design solutions and careful space planning, ultimately resulting in a simple, elegant and functional space suitable for all the needs of the family. The upper terrace behind the large retaining wall became a fruit and citrus orchard, which the family had always wanted. Other types of stone were installed to tastefully contrast with homeowner’s existing flagstone. An arbor was created to give a view corridor from the outside office to the seating area, and the view was preserved with a built-in concrete sofa on an eye-catching flagstone patio. Lush plant material and a bubbling fountain add to this distinctive landscape.